I received your kind letter before I left Readville—and beg you will excuse my long delay in answering you. Besides other matters to occupy my attention, you will appreciate the fact of my having a more voluminous private correspondence than ever before. You may have heard from Effie of our doings, since we left Boston‚ — though, to be sure, I don’t know how many of my letters have reached home. We have only heard from there once. I am totally in the dark as to what has been going on in other parts of the country for two weeks past. The last paper I saw, was of June 6. I should like to ask your opinion on a subject, which has troubled me a little lately. On a late expedition we made with Montgomery—he burnt the town of Darien about 20 miles from here. We had met with no resistance there & the only men to be seen were some horsemen at a great distance. There were a few women & darkeys in the place and a great many more had gone off in vehicles on our approach. It was never known to be a refuge for guerillas, and our gunboats have been in the habit of running by it at will & without opposition. Don’t you think that unless it is a settled policy of the Government to destroy all the property in rebeldom, the desttuction of a defenceless town, containing only a few non-combatants, is unjustifiable, and contrary to all rules of warfare? Harry writes me that you have been transferred to Heintzelman, so I suppose there is a good chance of your remaining for some time, near Washington. Good, for Effie. Now you are so near Headquarters, can’t you do something towards getting Barlow for us? I have just heard from him under date of May 21. He says he had just received yours of March 20 & regrets very much not having got it before. He still wishes to command a colored Brigade & I have no doubt we should do something under him. Montgomery who seems the only active man in this Department, is enormously energetic, and devoted to the cause, but he is a bush-whacker—in his fighting, and a perfect fanatic in other respects. He never drinks, smokes or swears, & considers that praying, shooting, burning & hanging are the true means to put down the Rebellion. If he had been educated as a military man in rather a different school, I think he would accomplish a great deal, & he may yet in a certain way. He is very prompt & active, never lying idle, if he can help it, for more than three days at a time. When delayed and disappointed, he is wonderfully patient & calm, never letting a word escape him & putting through what he undertakes in spite of everything. I never met a man who impressed me as being more conscientious. Isn’t it strange, being back at the old work again under such different circumstances. I shan’t realize until about two years after the war is over, that I am married. I have often thought since I left, of our meetings at Harper’s Ferry, and how little I supposed then that we should be so intimately connected. I hope this war will not finish one or both of us, and that we shall live to know each other well. I had a note from Effie a week ago. I remember, at Susie’s, just after you were engaged you said to me: “Am not I a lucky fellow?” And I must say, I think you are. There are not many girls like Effie; though she is my sister, I may say it. Hoping to hear from you occasionally, believe me, dear Charley. —My last letter I had supposed would be the last to be written from this camp, but so much for “newspaper yarns,” we are still here. This week has been in the estimation of the men, the greatest in the history of regiments, the presentation of colors, an excursion, and last, but not least, the payment of the State bounty. 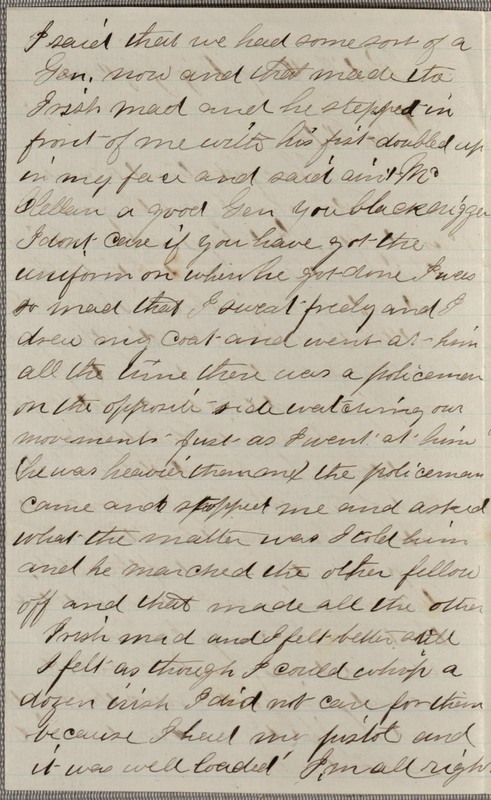 We had almost despaired of ever getting the last mentioned excitement, but it has come, and many a wife and widowed mother will have for a little while, at least something to purchase bread; on the whole, I think, there has more money been sent home to relatives of men in this regiment than any other which has been paid their bounty. But of course among a thousand men, there must be a large amount of money wasted; the sutler, patent jewelry venders, watch pedlars and many other kinds of pedlars are reaping a rich harvest. Why, it is enough to make a “feller” love “human natur” to see how very obliging the said pedlars are; they will even condescend to sell a pair of boots worth $4 for the moderate sum of $8, and other traders ask a proportionate sum. Gen. Pierce put a veto on them though, after he found out how the cat was jumping; he told one man he should sell nothing to the men unless he received an order from himself and agree[d] to conform to a reasonable price, the General to determine the price. The men will appreciate his kindness after their greenbacks are gone. We have received marching orders; the order was read at dress parade last Thursday, so next Sunday I think we shall be on our way to Dixie. We have crowds of visitors daily, drawn, no doubt, by the great reputation the regiment is gaining for proficiency in drill. The band is a success. It is only ten days since they first commenced practice, but they have played on dress parade three times. It seems that most every man in the regiment vies with each other in excellence in whatever they undertake. It is, I think, one of the best guarantees that the 54th will be a credit to old Massachusetts wherever it goes. The citizens of this Commonwealth need not be ashamed of the 54th now; and if the regiment will be allowed a chance, I feel confident the Colored Volunteers will add glory to her already bright name. There is not a man in the regiment who does not appreciate the difficulties, the dangers, and maybe ignoble death that awaits him, if captured by the foe, and they will die upon the field rather than be hanged like a dog; and when a thousand men are fighting for a very existence, who dare say them men won’t fight determinedly? The greatest difficulty will be to stop them. [1863-05-24] NEWS FROM WASHINGTON. ; EMPLOYMENT OF THE CONTRABANDS. Mr. Commander—Although the presentation of a stand of colors to a noble body of men is no new scene in this Commonwealth, this occasion is a novel and peculiar one—there is an importance attached to this occasion which never existed with any similar event. Today we recognize the right of every man in this Commonwealth to be a MAN and a citizen. We see before us a band of as noble men as ever came together for a great and glorious cause; they go not for themselves alone, but they go to vindicate a foul aspersion that they were not men; and I rejoice to see men from other states who have cast their lot in with ours—we welcome them as citizens of the Old Bay State. We not only see the germs of the elevation of a downtrodden and despised race, but a great and glorious future spread out before us, when the principles of right and justice shall govern our beloved country. You, Mr. Commander, have reason to be proud that you have the privilege of being the pioneer in this great and glorious cause, as the Chief of the Fifty Fourth Regiment of Massachusetts Volunteers. And my earnest prayer is that you will ever have in view a lively interest in its efficiency and glory in the field, as you have thus far shown in its organization. I now have the honor, in behalf of the colored ladies of Boston, to present to you, sir, for the 54th regiment of Mass. volunteers, the American Flag; and before it shall ever be surrendered to the foes may its white stripes be spattered with the red blood of their brethren who bear it in the field. I now have the honor of presenting the 54th, through you, sir, in behalf of the Commonwealth, the arms of the State of Massachusetts; and I say today, from the beginning of this rebellion to the present day, that banner has never been surrendered to the foe; fifty-three regiments have marched from the old Bay State, but we have yet to learn that they ever surrendered that noble banner. Hold on to the staff, if every thread is blown away, your glory will be the same. Here is a banner, bearing for its emblem the Goddess of Liberty; take this, sir, in behalf of the colored ladies of Boston and the Commonwealth, for the 54th regiment Mass. volunteers. May you and your men prove that this emblem was never carried by worthier hands. And here I have the solemn pleasure of presenting you, sir, in behalf of the near and dear relatives of one of Massachusetts noble soldier boys, who gave his life for his country’s cause, Lieut. Putnam, the emblem which it bears, the symbol of the Christian, a Cross. While in the battle’s rage, you cast your eyes on this Christian banner, remember, sir, the example of the gallant man who took it for his guide. Though you fall in your country’s defence, with a just and sincere appreciation of the teachings inculcated by that banner, your spirit will soar to that home in store for those who faithfully do their duty here to Humanity, their Country and their God! And now let me thank you, sir, Mr. Commander, and your assistant officers, for the faithful discharge of the trust reposed in you all. I declare to you today, that the 54th regiment of volunteers will ever be to me a source of solicitude; it is an undertaking, which if it fails, I fail with it; not only myself in my official capacity, but thousands in the old Bay State will watch its progress with earnest, heartfelt interest; if on the field, this noble Corps shall prove as valiant as it is proficient in discipline and drill, the fondest well wisher of this cause will be amply rewarded. You Mr. Commander, have an important trust confided to you; your own honor as a man, and commander, the sound and wholesome discipline of a class unused to military life, that they as well as yourself, may add lustre to the glory of your native State. Your country’s honor, and the safety of these men, depend upon you; a nobler corps ne’er tread the soil of Massachusetts, and I am proud tosay, much is due you for the military spirit they exhibit to-day; again [illegible] the flag. It will be my earnest endeavors to faithfully perform all that is possible for the honor and glory of the 54th regiment volunteers; I consider it an honor to lead men, although many of them not citizens of Massachusetts, who exhibit such unmistakable evidences of patriotism; and I will take this occasion to express my sincere thanks to the officers, and men, for their untiring efforts to assist me in maintaining order, and a faithful discharge of every duty. Mr. I.D. Hall and Mr. John Goings will please accept the thanks of Company C, for a present of tobacco, two twenty-five pound boxes; we can assure them it is very acceptable, as many of us have not had any tobacco for some time. As soon as the transports are ready, we shall be off; that may not be for a week, though. I shall find out to-morrow, if possible, and telegraph Father; if I don’t see you and Father before I go, I shall be terribly disappointed. Effie and Nellie are at Milton Hill to tea this evening. Cabot Russel and Wilkie James hired a large “carryall,” and drove them over. They thought the carryall more in accordance with your ideas of propriety, than separate buggies. You will wonder, no doubt, at our being taken from General Wilde. General Hunter wanted us, and I told the Governor I thought the men would have a better chance for work than with Foster. The latter, as likely as not, would make us do all the digging of the department. Friends [of the regiment] had procured flags, and it was determined to make the occasion of their presentation, on May 18, a memorable one. The day was fine and cloudless. Very early, friends of the command began to arrive in private carriages, and by the extra trains run to Readville. Many prominent persons were present, including Surgeon-General Dale, Hon. Thomas Russell, Professor Agassiz, Prof. William B. Rogers, Hon. Josiah Quincy, George S. Hale, William Lloyd Garrison, Wendell Phillips, Samuel May, Rev. Dr. Neale, Frederick Douglass, and many others. The parade was thronged with white and colored people of both sexes, to the number of over a thousand. COLONEL SHAW : As the official representative of the Commonwealth, and by favor of various ladies and gentlemen, citizens of the Commonwealth, and friends of the Fifty-fourth Regiment of Massachusetts Volunteers, I have the honor and the satisfaction of being permitted to join you this morning for the purpose of presenting to your regiment the national flag, the State colors of Massachusetts, and the emblematic banners which the cordial, generous, and patriotic friendship of its patrons has seen fit to present to you. Two years of experience in all the trials and vicissitudes of war, attended with the repeated exhibition of Massachusetts regiments marching from home to the scenes of strife, have left little to be said or suggested which could give the interest of novelty to an occasion like this. But, Mr. Commander, one circumstance pertaining to the composition of the Fifty-fourth Regiment, exceptional in its character, when compared with anything we have seen before, gives to this hour an interest and importance, solemn and yet grand, because the occasion marks an era in the history of the war, of the Commonwealth, of the country, and of humanity. 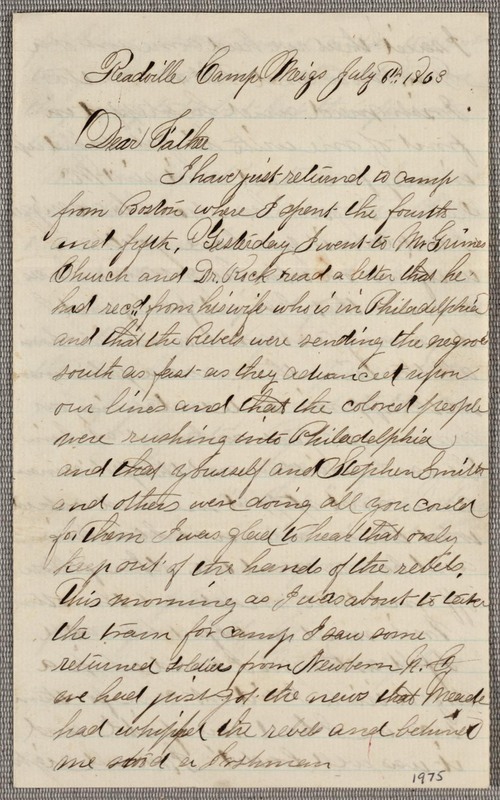 I need not dwell upon the fact that the enlisted men constituting the rank and file of the Fifty-fourth Massachusetts Regiment are drawn from a race not hitherto connected with the fortunes of the war; and yet I cannot forbear to allude to the circumstance for a brief moment, since it is uppermost in your thoughts, and since this regiment, which for many months has been the desire of my own heart, is present now before this vast assembly of friendly citizens of Massachusetts, prepared to vindicate by its future, — as it has already begun to do by its brief history of camp life here, — to vindicate in its own person, and in the presence, I trust, of all who belong to it, the character, the manly character, the zeal, the manly zeal, of the colored citizens of Massachusetts, and of those other States which have cast their lot with ours. I owe to you, Mr. Commander, and to the officers who, associated with you, have assisted in the formation of this noble corps, composed of men selected from among their fellows for fine qualities of manhood, — I owe to you, sir, and to those of your associates who united with me in the original organization of this body, the heartiest and most emphatic expression of my cordial thanks. I shall follow you, Mr. Commander, your officers, and your men, with a friendly and personal solicitude, to say nothing of official care, which can hardly be said of any other corps which has marched from Massachusetts. My own personal honor, if I have any, is identified with yours. I stand or fall, as a man and a magistrate, with the rise or fall in the history of the Fifty-fourth Massachusetts Regiment. I pledge not only in behalf of myself, but of all those whom I have the honor to represent to-day, the utmost generosity, the utmost kindness, the utmost devotion of hearty love, not only for the cause, but for you that represent it. We will follow your fortunes in the camp and in the field with the anxious eyes of brethren, and the proud hearts of citizens. To those men of Massachusetts and of surrounding States who have now made themselves citizens of Massachusetts, I have no word to utter fit to express the emotions of my heart. These men, sir, have now, in the Providence of God, given to them an opportunity which, while it is personal to themselves, is still an opportunity for a whole race of men. With arms possessed of might to strike a blow, they have found breathed into their hearts an inspiration of devoted patriotism and regard for their brethren of their own color, which has inspired them with a purpose to nerve that arm, that it may strike a blow which, while it shall help to raise aloft their country’s flag — their country’s flag, now, as well as ours—by striking down the foes which oppose it, strikes also the last shackle which binds the limbs of the bondmen in the Rebel States.I know not, Mr. Commander, when, in all human history, to any given thousand men in arms there has been committed a work at once so proud, so precious, so full of hope and glory as the work committed to you. And may the infinite mercy of Almighty God attend you every hour of every day through all the experiences and vicissitudes of that dangerous life in which you have embarked; may the God of our fathers cover your heads in the day of battle ; may He shield you with the arms of everlasting power ; may He hold you always— most of all, first of all, and last of all — up to the highest and holiest conception of duty, so that if, on the field of stricken fight, your souls shall be delivered from the thraldom of the flesh, your spirits shall go home to God, bearing aloft the exulting thought of duty well performed, of glory and reward won, even at the hands of the angels who shall watch over you from above ! Mr. Commander, you, sir, and most of your officers, have been carefully selected from among the most intelligent and experienced officers who have already performed illustrious service upon the field during the two years of our national conflict. I need not say, sir, with how much confidence and with how much pride we contemplate the leadership which this regiment will receive at your hands. In yourself, sir, your staff and line officers, we are enabled to declare a confidence which knows no hesitation and no doubt. Whatever fortune may betide you, we know from the past that all will be done for the honor of the cause, for the protection of the flag, for the defence of the right, for the glory of your country, and for the safety and the honor of these men whom we commit to you, that shall he either in the human heart, or brain, or arm. And now, Mr. Commander, it is my most agreeable duty and high honor to hand to you, as the representative of the Fifty-fourth Regiment of Massachusetts Volunteers, the American flag, “the star-spangled banner” of the Republic. Wherever its folds shall be unfurled, it will mark the path of glory. Let its stars be the inspiration of yourself, your officers, and your men. 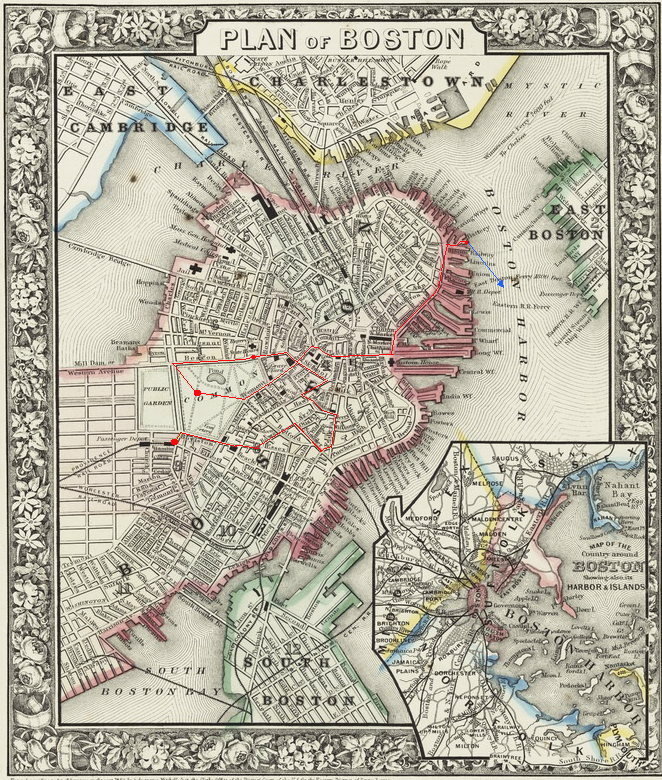 As the gift of the young ladies of the city of Boston to their brethren in arms, they will cherish it as the lover cherishes the recollection and fondness of his mistress; and the white stripes of its field will be red with their blood before it shall be surrendered to the foe. And now let me commit to you this splendid emblematic banner. It is prepared for your acceptance by a large and patriotic committee, representing many others besides themselves, — ladies and gentlemen of Boston, to whose hearty sympathy and powerful cooperation and aid much of the success which has hitherto attended the organization of this regiment is due. The Goddess of Liberty erect in beautiful guise and form; Liberty, Loyalty, and Unity, — are the emblems it bears. The Goddess of Liberty shall be the lady-love, whose fair presence shall inspire your hearts; Liberty, Loyalty, Unity, the watchwords in the fight. And now, Mr. Commander, the sacred, holy Cross, representing passion, the highest heroism, I scarcely dare trust myself to present to you. It is the emblem of Christianity. I have parted with the emblems of the State, of the nation, — heroic, patriotic emblems they are, dear, inexpressibly dear to all our hearts; but now In hoc signo vinces, — the Cross which represents the passion of our Lord, I now dare to pass into your soldier hands; for we are fighting now a battle, not merely for country, not merely for humanity, not only for civilization, but for the religion of our Lord itself. When this cause shall ultimately fail, if ever failure at the last shall be possible, it will only fail when the last patriot, the last philanthropist, and the last Christian shall have tasted death, and left no descendants behind them upon the soil of Massachusetts. This flag, Mr. Commander, has connected with its history the most touching and sacred memories. It comes to your regiment from the mother, sister, friends, family relatives, of one of the dearest and noblest boys of Massachusetts. I need not utter the name of Lieutenant Putnam in order to excite in every heart the tenderest emotions of fond regard, or the strongest feeling of patriotic fire. May you, sir, and these, follow not only on the field of battle, but in all the walks and ways of life, in camp and hereafter, when, on returning peace, you shall resume the more quiet and peaceful duties of citizens,— may you but follow the splendid example, the sweet devotion, mingled with manly, heroic character, of which the life and death of Lieutenant Putnam was one example ! How many more there are we know not, —the record is not yet complete ; but oh, how many there are of these Massachusetts sons, who, like him, have tasted death for this immortal cause! Inspired by such examples, fired by the heat and light of love and faith which illumined and warmed these heroic and noble hearts, may you, sir, and these march on to glory, to victory, and to every honor! This flag I present to you, Mr. Commander, and your regiment. In hoc signo vinces. YOUR EXCELLENCY : We accept these flags with feelings of deep gratitude. They will remind us not only of the cause we are fighting for, and of our country, but of the friends we have left behind us, who have thus far taken so much interest in this regiment, and whom we know will follow us in our career. Though the greater number of men in this regiment are not Massachusetts men, I know there is not one who will not be proud to fight and serve under our flag. May we have an opportunity to show that you have not made a mistake in intrusting the honor of the State to a colored regiment, — the first State that has sent one to the war. I am very glad to have this opportunity to thank the officers and men of the regiment for their untiring fidelity and devotion to their work from the very beginning. They have shown that sense of the importance of the undertaking without which we should hardly have attained our end. After the command was reviewed by the Governor, the battalion was dismissed, and officers and men devoted themselves to the entertainment of their guests. 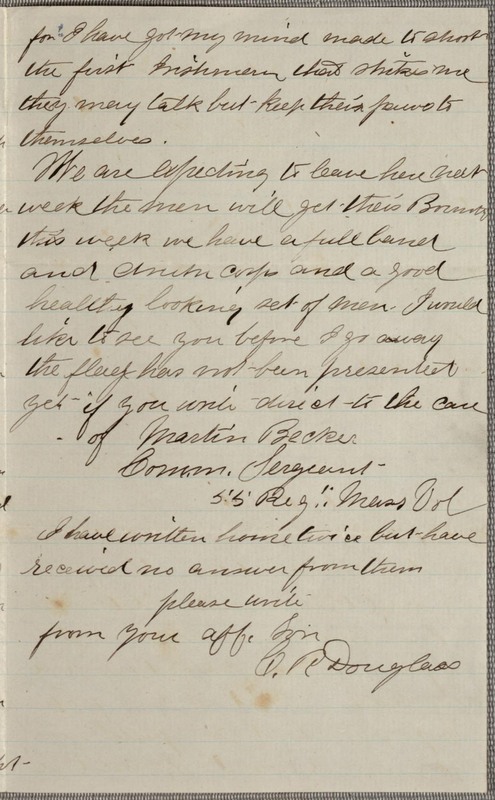 —The past week has been one of progress with the 54th: 68 more men will make it a full regiment, if all the men are retained, which I think is rather doubtful, as there is about a dozen or more who, by the trying effects of camp life, are not physically able to be retained as good able soldiers. So far as physical ability is concerned and qualities of endurance as a regiment, the 54th will compare favorably with any ever raised in the State; indeed had every man been received who has applied, the regiment would have been filled at least three weeks since. Those having the raising of the regiment in charge are entitled to praise in not enlisting all sorts of men, regardless of their fitness to bear the hardships of military life, a striking contrast to the manner in which some of our regiments were raised. If they could only get 1000 men, they never thought of the fact that good sound men, although recruited slowly, would be better for themselves in the end. A number of regiments in the field, thinned out by sickness more than battle, had to be consolidated, so that the high “comish” in some cases will have to follow the unheroic paths of commerce or law once more. Surgeon General Dale paid an official visit to the camp last Monday and reviewed the battalion. He appears to seem satisfied that the boys will do. That flag presentation didn’t come off, and it is very probable it won’t, or else it is such a big one it takes a long time to make it. Well, I suppose it is, and it will be bigger before we see it. By the papers we see Richmond is not taken yet; it would be a little strange if the 54th were destined to tear down Jeff. Davis’ nest. I think our boys would like such a job as that; they might not do it so scientifically as some, but they would never know when they were whipped, and that is the feeling which should pervade every man in the Union armies. Let every man feel that he has got a personal or family interest in this war, as the leaders of the South have, and with the immense armies, means and fleets the government have got, the rebellion would be speedily crushed. The American people, as a nation, knew not what they were fighting for till recently, and many have different opinions now as to the ends and results of the contest. But there is but two results possible, one is slavery and poverty and the other is liberty and prosperity. The latter can be preserved by oneness and singleness of purpose in regard to this contest, or the former will be sure, if love of place, prejudice and partisanship blind them so that they cannot see their way. Let every man of color consider that he has an interest in this war as well as the white man, and it will be well with them.